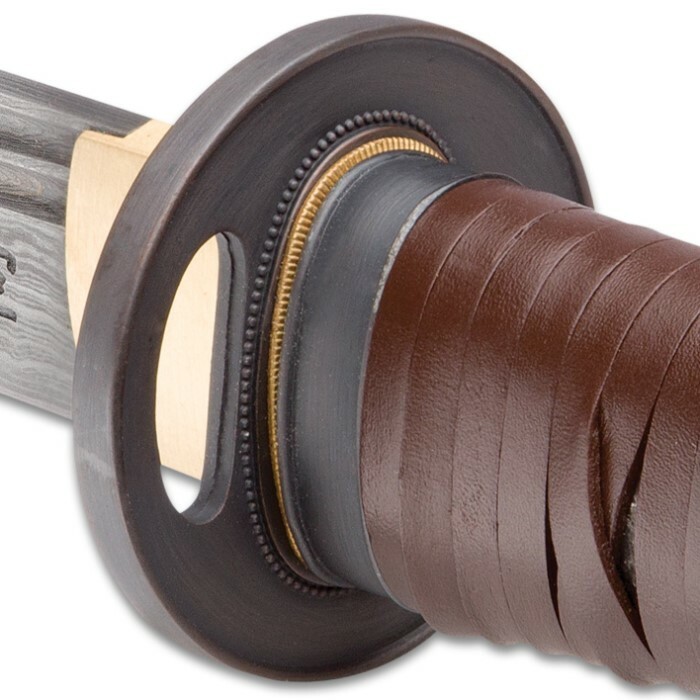 Shikoto’s “Rurousha” Katana may be stylishly bound in genuine leather bands, but it refuses to be bound by traditional notions of “orthodox” sword design. And when it comes to shear strength and raw cutting power, the Rurousha simply knows no bounds! Indeed, the Rurousha is one-of-a-kind in style, engineering, appointments and more – from its robust, breathtakingly beautiful Damascus steel blade to its rustic, leather-centric garb and beyond. 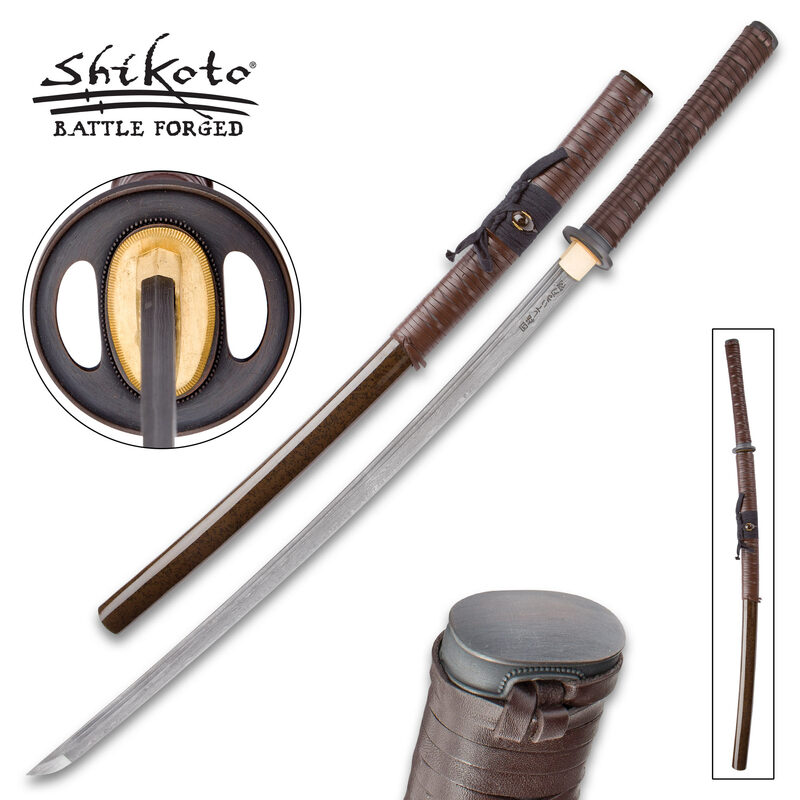 Shikoto developed the Rurousha with the serious swordsman in mind. Master smiths painstakingly hand forge every blade, and seasoned sword artisans carefully handcraft each tsuka and saya. From vigorously hammering the molten blade steel to gingerly wrapping the leather thongs around the tuska and saya, every step in the Rurousha's construction receives the utmost care and precise attention to detail. Some of the world's - and history's - most revered, time-tested techniques are employed, and every material meets or exceeds stringent quality standards. A quintessential example is the Rurousha's eye-catching Damascus steel tanto blade, which teems with potency and visual splendor – a spectacular wonder in its own right, with its contrasting lines, waves, swirls and other mesmerizing patterns. Each line is a distinct variety of steel, hammer welded and folded repeatedly to yield the thousands of layers in each Rurousha blade. The unique metalsmithing technique’s roots stretch back to the Middle Ages, and today it’s still painstakingly performed by seasoned hands, unsullied by soulless automation and disconnected mechanization. In a nutshell, a master Shikoto swordsmith from the ancient sword-making village of Longquan fires a stack of steel strips - each a different alloy - in a white-hot forge until the metal glows cherry red. He then removes the stack and hammers it until it’s around half as thick as the original. Then he folds the metal onto itself lengthwise and hammers each half together. The process is meticulously repeated – hundreds of times in some cases – until the desired layering effect is achieved, at which point a final quenching strengthens the resulting blade blank and an acid etching highlights vivid contrasts in the layers. And the slow, laborious process itself it just the beginning! In order to achieve sufficiently dramatic contrasts, Shikoto’s master smiths must expertly select an appropriate combination of steel alloys of varying color, luminescence and other visual qualities. For the sake of strength, resilience and countless additional blade factors, the smiths must also must consider each alloy’s distinct melting point, proper stacking order, forge temperature and myriad other variables. Simply put, an unbelievable quantity of blood, sweat and tears goes into every Rurousha blade, but lay eyes on it just once, and you’ll know it was well worth the trouble. Furthermore, like a steel snowflake or fingerprint, the patterning on no two Rurousha blades is exactly alike. But the Ruruousha is so much more than a pretty face. More like a “wild beast decked out in regal robes,” the Rorousha’s stout tanto blade slices effortlessly and pierces cleanly through even the most challenging materials, retaining its carefully honed, razor sharp edge through even the most brutal cutting trials. The Rurousha's weight is shrewdly distributed to maximize swinging momentum and power, blow after devastating blow. This impeccable balance also improves control and responsiveness, allowing for greater agility and flexibility in combat. 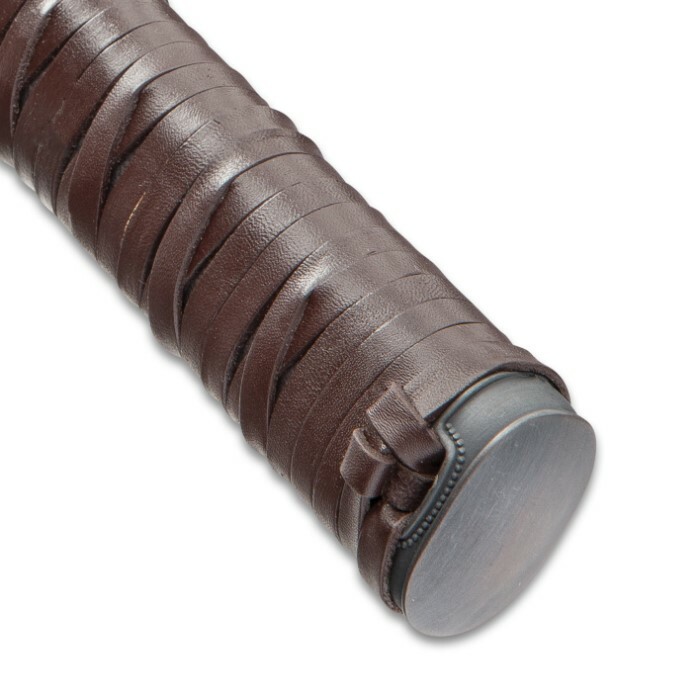 The leather wrapping that encircles the tsuka affords a comfortable, no-slip grip, further enhancing the Rurousha’s superb feel. Flawlessly cast, the tsuba features a clean, no-frills design, bathed in a warm, antiqued patina. The Rurousha has proven itself time and again, and it holds its own against any of today's most expensive katana, outperforming many. But the old cliché is true - "action" does indeed "speak louder than words," and at this unbeatable, downright unheard of price, why deny yourself the opportunity to experience Shikoto's Rurousha Katana for yourself? No matter how you use it, with proper care you can enjoy it for a lifetime, then pass it down to your children, grandchildren or great-grandchildren! The Rurousha is heirloom-quality and built to be treasured by generations of your descendants - your legacy preserved in hand forged Damascus steel. To say the least. Awesome crafsmenship. Beautiful replica. Not really Battle ready. A few slides still sharp, a little worpping. Maybe something went wrong with a quinch on this particular piece. But it's been years since I bought mine (2009). 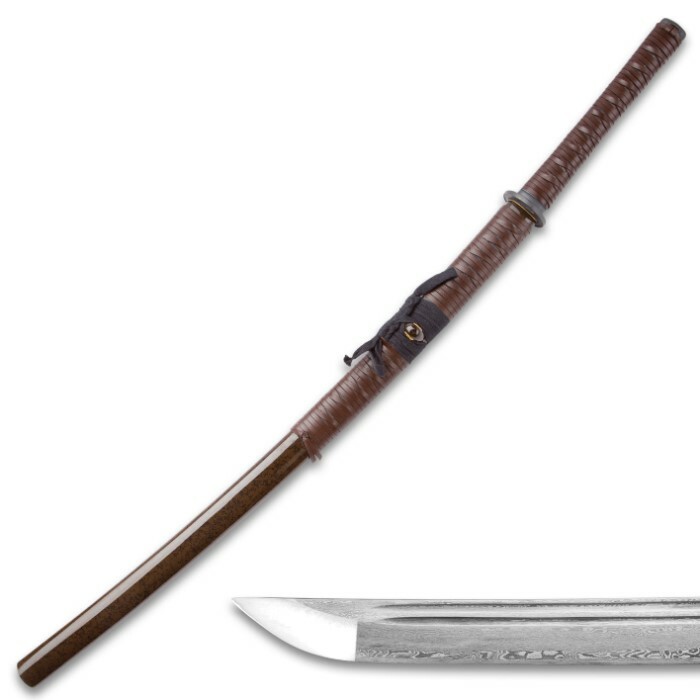 I received the Shikoto Rurousha Katana as a random gift and I have to say that even if I had picked out a katana to buy myself it would have been this one! 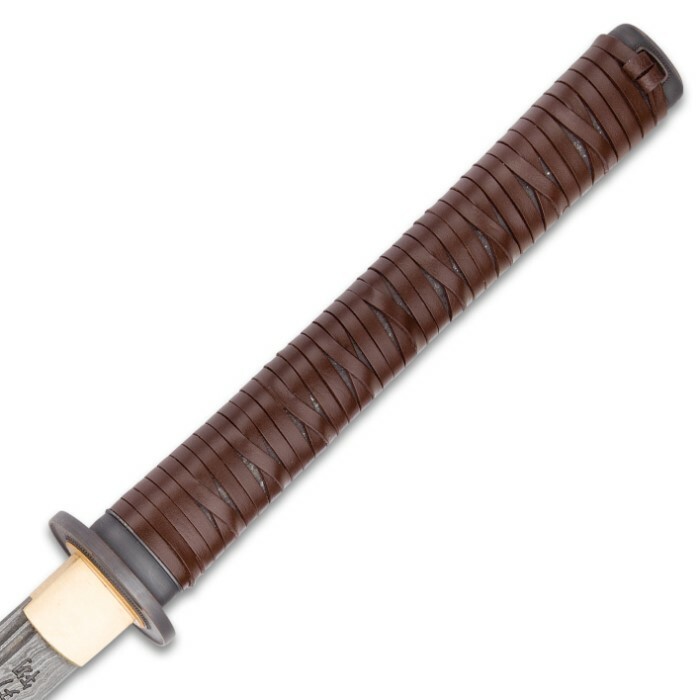 The only negative thing I have to say about it is concerning the saya (Sheath), and it is mostly just a cosmetic issue, and has nothing to do with its functional use. 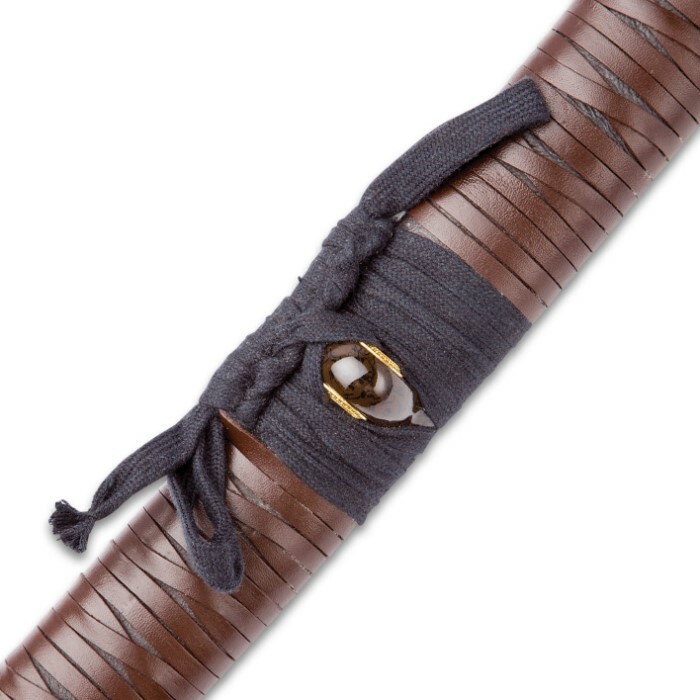 The "issue" is with the bottom half of the saya (the part that isn't leather wrapped). Whatever it is painted/coated with is so prone to receiving nicks/dents/scratches that even tapping it with a literal pencil can leave a blemish on it. But as long as you are extremely careful and aware of your surroundings this shouldn't be a problem. 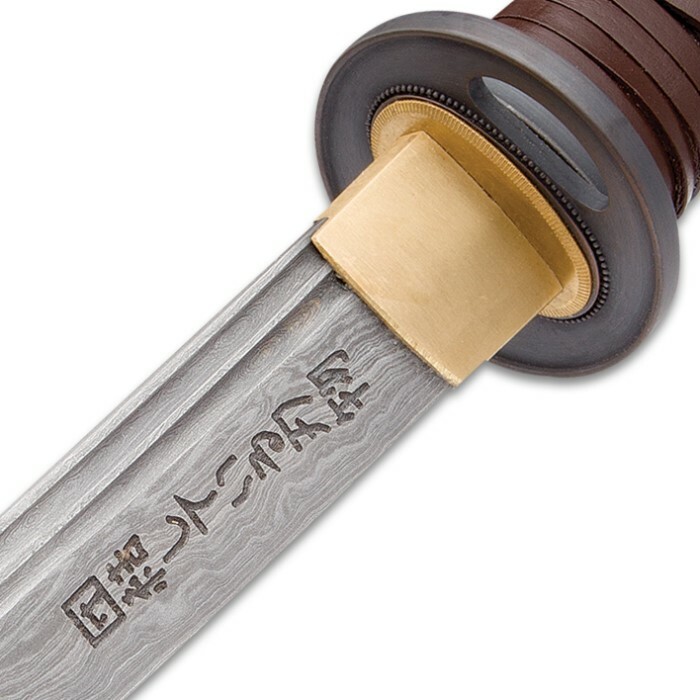 Aside from that it is an amazing katana, and it is definitely worth the money! I would never regret purchasing this sword! This is the sword of all swords, at least in my opinion. Could not be more pleased, such great craftsmanship.... Not to mention, razor sharp. A true beauty and I would highly recommended it. I waited 4 months and it was worth the wait. A excellent addition to my collection. I bought this sword a few months ago and decided to write a review after I saw the thumbnail. Since I bought it a while ago I don't remember how fast it was shipped so I cant comment of that. The sword itself is perfect, my only problem is that the saya is extremely hard to get off and the leather wrap at the bottom of the handle is a bit loose but the ret of the wrap was tight so it isn't a real issue. The brown color is also a bit darker than in the picture but not by much. Other than that the sword is as advertised, it comes sharp and is very light compared to my other two katana which are shorter. I love it! Wonderful blade pattern you could gaze into for days... Solid construction and fittings. Well done! It is my favorite katana by far. Thank you! Wonderful sword. Ridiculous shipping speed. It arrived two days after purchase date. I love it. It's not the sharpest blade, but that is the samurai's job to do that aka the owner. The gaurd is a little loose and it's hard to unsheath sometimes. I consider those unable too be unworthy to draw the blade. I would recommend it. The only things I'm gonna fix are the sharpness which is fine, replace the stock wrappings with rawhide leather, and just tighten it up a bit. I recommend this lil babe. Its a true weapon to be proud of, the blade is very artistic in its wood like finish, if ever you needed a weapon to protect you or display this an excellent choice. I've been collecting for some time now and this takes the front mantle of my display.